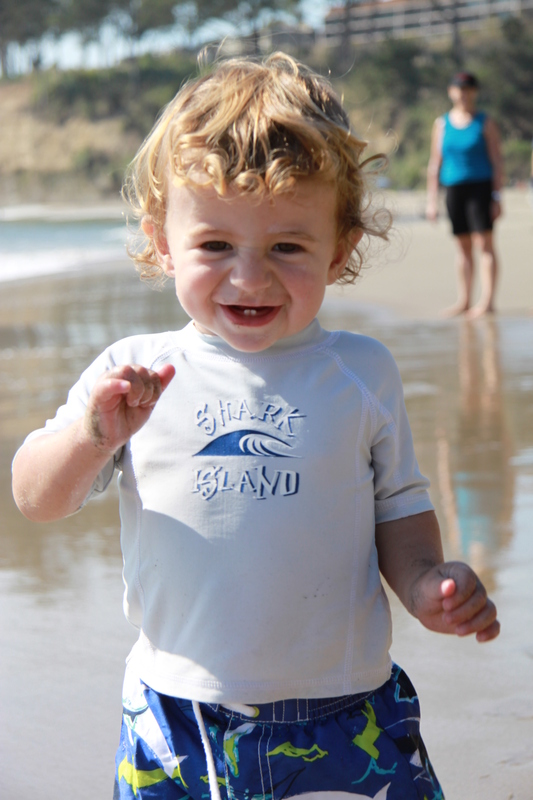 We love going to the shore, and North Cali beaches seem to be at their finest in October. There’s just one problem. Pumpkins. 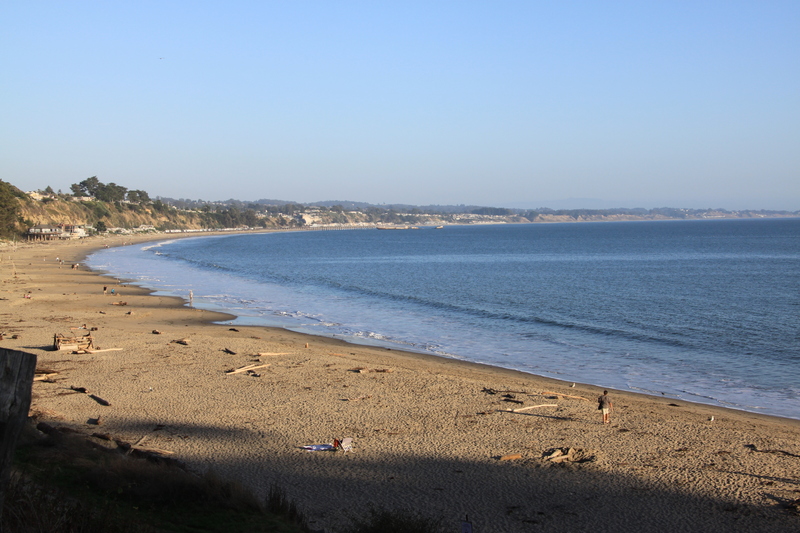 It takes more intrepid souls than us to sit in three hour traffic to Half Moon Bay on October weekends, so we’ve used the past few weeks to check out some more Santa Cruz beaches. New Brighton State Beach has quickly become a favourite. It’s absolutely beautiful and usually (by my European standards) really, really empty. An added plus in October are the monarch butterflies–we were surrounded by them on the short walk down to the sand. The beach here is wide and slopes gently to the sea. : perfect for sand play and paddling. The boys loved it. There was plenty of parking right by the beach. I should mention there is a $10 charge to park: coming from England I think that is entirely reasonable for a day use fee, but I did meet one American who thought it was outrageous. The state beach is nicely maintained. 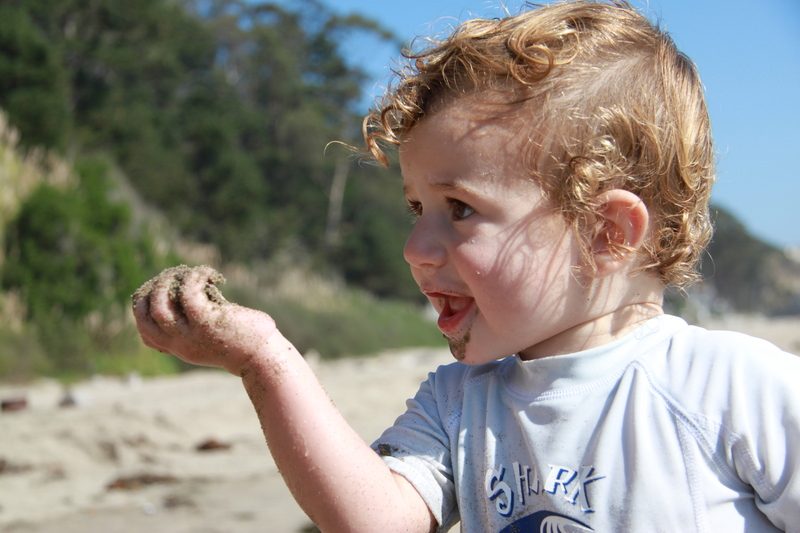 There aren’t many amenities, but there are basic bathrooms and a great outdoor shower to de-sand toddlers. 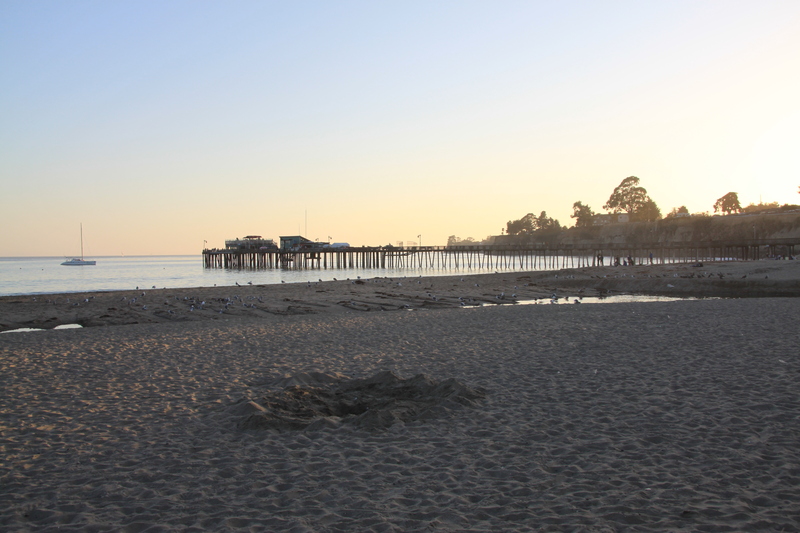 We stopped in Capitola on the way home and found a fish and chip supper with this view. Hard to beat. 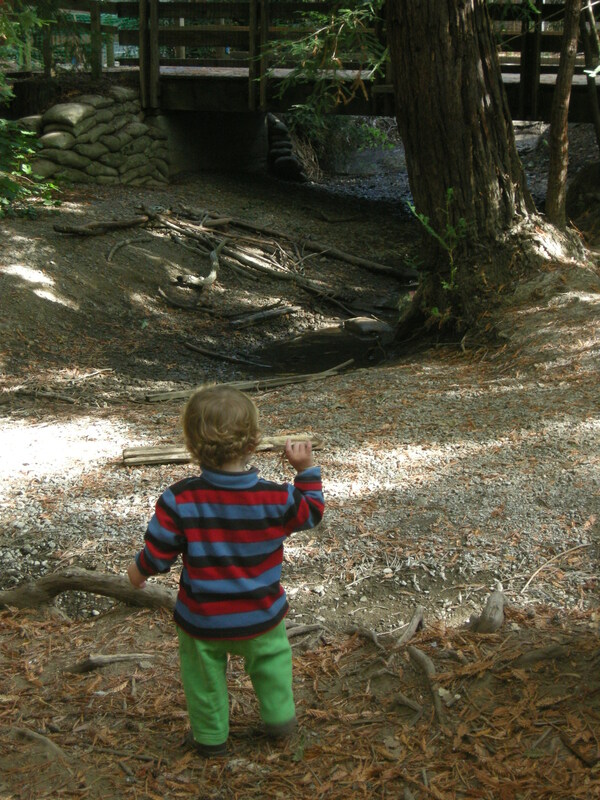 The Redwood Grove Nature Preserve in Los Altos is one of my boys’ favorite local spots. This hidden gem lies just off University Avenue a hundred feet south of better known Shoup Park. There are no big signs, and no designated parking. You just find a spot on University and head down the paved road into the forest. At the bottom of the road you enter the speckled light of a beautiful old redwood grove. 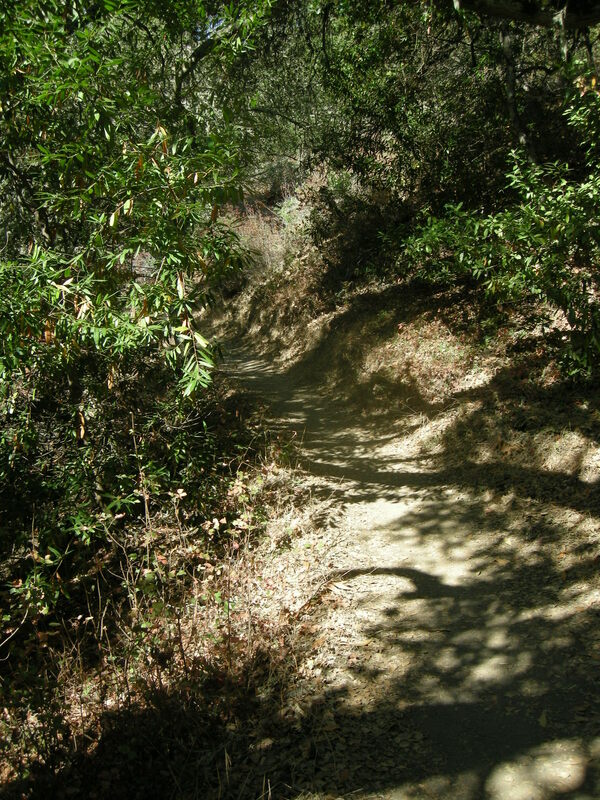 There is a wide boardwalk trail winding through the trees and along Adobe Creek which is easy to navigate with kids and strollers. My toddlers love running along this boardwalk, and I can relax and let them explore safe in the knowledge that no cars or bikes will come whizzing past. At places you can climb down off the trail and play in the creek (although it does dry up completely towards the end of summer) and there’s plenty of opportunity for wildlife spotting. The Monkey has become quite adept at finding and pointing out every banana slug in the grove. We usually take a bucket along for collecting leaves and sticks as there is so much for the boys to notice. At one side of the boardwalk there is a grassy area complete with picnic tables and hay bales to climb on which makes an excellent snack stop, and from there you can also head up the short hillside track and check out the old, dis-used animal cages and vegetable garden. There’s plenty to keep busy little ones happy, and there is something magical about the place. It’s so quiet and secluded that it’s hard to imagine you’re in the heart of Silicon Valley. In fact, each time we’ve been, our group has been the only people there. I think it’s Los Altos’ best kept secret. We intend to keep going back all winter to watch how the forest and creek change throughout the winter season and to enjoy as much peace and seclusion as one can with two toddling companions. Last week we checked out Edgewood Park for a spot of hiking. The Edgewood trails are great for summer as most of them just wind through shady forests, and those that do emerge into the upper grasslands usually have a nice breeze (as well as wonderful views). The paths are quite steep and windy which my kids enjoy, but this is definitely a park for the more serious hiking family. You do have to put in some work to get above the tree line and enjoy the views. 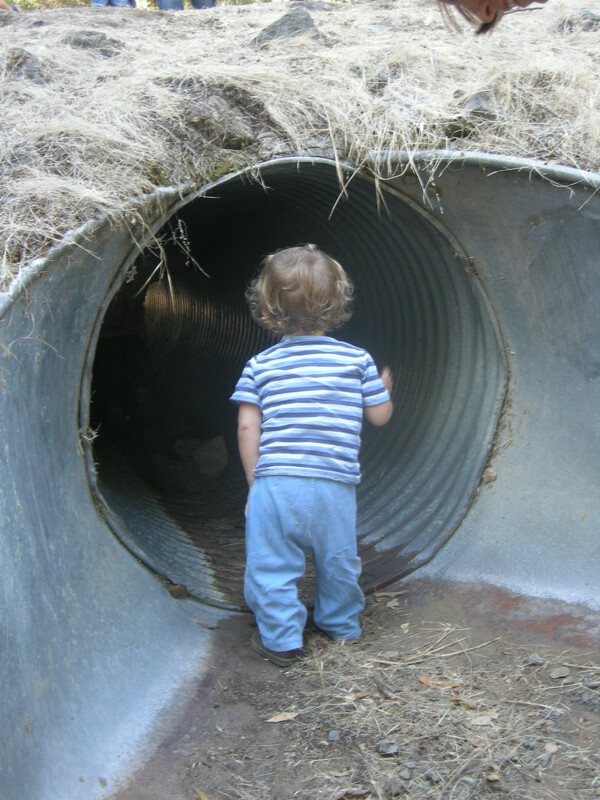 The preserve works for us on those days when my toddler is in an easy-going mood and is happy to meander around. On those days when he needs a destination, and he needs to get to it quickly, I usually choose another park. I no longer take the double jog stroller–pushing that up to the upper meadows last spring was serious work–but you can make it up with a single jog stroller easily enough if you don’t mind some steep inclines. 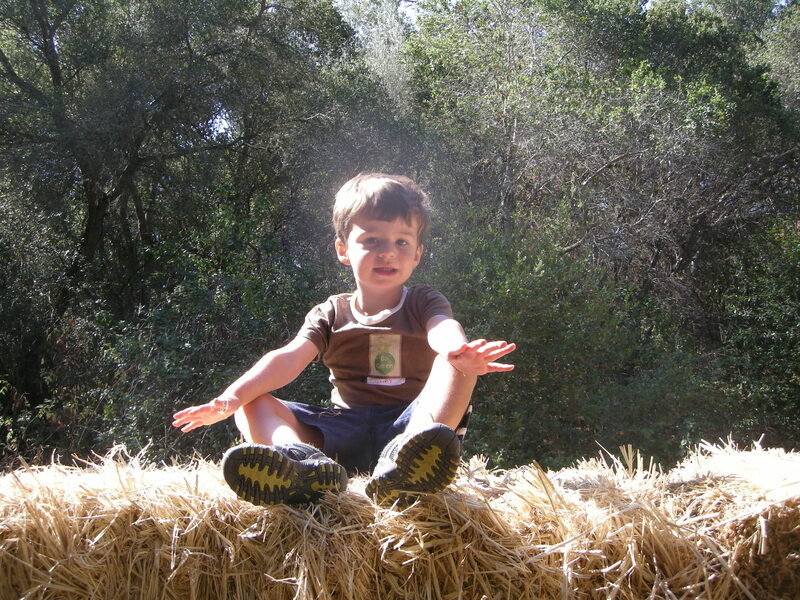 Other than the trails, this preserve has a couple of nice features for pre-school age kids. There are numerous rocky areas for scrambling and lizard spotting, and a big, old, short drainage tunnel which is fun to play in during the summer months. Edgewood preserve has nicer amenities than most. Just past the lower car park, a little way up the hill, there are toilets and bathrooms and a shady picnic area by a field where toddlers can let off steam. My only complaint about Edgewood is the parking. The two car parks are tiny and usually full, which means having to park on Edgewood Road and loading and unloading toddlers into heavy traffic. Afternoons seem slightly better than mornings for grabbing a spot.